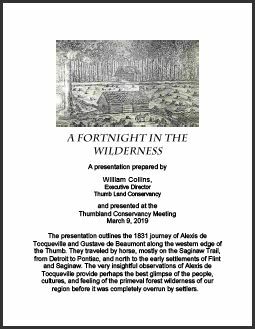 At the end of this news brief is a link to an updated version of the presentation I gave at the TLC Meeting on March 9th which includes some additional details. As part of the discussion during the presentation, Terry asked a few good questions. She wondered what that thing is hanging from Beaumont’s lapel in his portrait. I did some searching, and it appears to be a type of “epaulet” that would normally be worn on the shoulder on a military uniform, with cords hanging over. I don’t know that he was in the military, but I did learn that he was basically an attorney for the French government for several years, even before they went to America. He later served as a representative for his region in the national government. The epaulet may be a type of government badge or honor. I was also curious about a thing hanging from the neck of Tocqueville. Turns out, I think it’s just a rectangular reading glass. I thought it might have been some Indian thing. Beaumont was described as “eloquent”, so my guess that he was kind of the rougher of the two (Tocqueville) may not be right. But, there was a point later when they crossed a river in Tennessee in winter, that Tocqueville got severe chills and Beaumont took charge in finding shelter, building a fire, and heaping whatever clothes he could on Tocqueville to warm him up. I recall other situations when he had to take charge physically like that. Another point is that Beaumont got the assignment to study the American prison system and Tocqueville basically tagged along. So, Beaumont played a bigger part in this whole trip I suspect while Tocqueville gets almost all of the credit. Tocqueville was described as being liberal and engaging in “asocial behavior”. Kind of funny that so many conservatives are quick to embrace Tocqueville as one of their own, not realizing apparently, that while he supported many basic conservative institutions and ideals, at the same time, he despised the vast majority of hypocrites that cared only about gaining wealth and elevating themselves as opposed to helping humanity as a whole. Another question Terry asked was why my friend in Minnesota, working for the US Forest Service, had the ash trees girdled up about head high instead of low. It dawned on me later, that girdling up higher would not kill the whole tree but just the top, so that the ash trees in this study could resprout. They probably would resprout if girdled near the ground also, but up higher would ensure that many new branches would form. So, the study would eventually be a little less damaging to the forest. That’s my guess anyway. Click the image below to open/download the PDF version of the presentation.